La Peregrina Pearl (the pilgrim), the famous historic pearl with the classic pear shaped body weighed an astonishing 203.84 grains was among Elizabeth Taylor's famous jewellery Collection that was auctioned over the 13th & 14th of December 2011 at Christie's, New York, Rockefeller Center. This extraordinary pearl pendant has a heavenly pink hue and was one of Taylor's most important jewels, that her late husband, Sir Richard Burton had given her. The famous Baroda Pearls and the celebrated La Peregrina are the most important Natural Pearls in the world. Elizabeth Taylor was not only a famous actress, but a humanitarian who was awarded the first Humanitarian Award for Aids Activism. Ms. Taylor was well known for her love of jewellery but not so well known was her extraordinary knowledge of jewellery. Over the years, Elizabeth Taylor had amassed one of the world's most Famous Jewelry Collections. And with a collection of jewels this magnificent, it is not surprising that Ms. Taylor often preferred to wear her own jewelry in many of Elizabeth Taylor movies. The Duchess of Windsor Diamond Brooch, a gift from Richard Burton. The peachy pear 69.42-carat pear-shaped diamond, newly named the Taylor-Burton Diamond. The Taj Mahl Diamond inscribed in Persian which hangs from a gold and ruby chain by Cartier. Richard Burton once commented that he would have purchased the Taj Mahl itself for her, except that it was too expensive to transport. In 1969, La Peregrina was put up for auction by Sotheby's, New York, and sold to a telephone bidder for 25,000 pounds sterling. Richard Burton was the bidder who bought the Natural Pearl as a Valentine's Day gift for his then wife, Elizabeth Taylor. La Peregrina was delivered to Taylor and Richard Burton in their suite in Caesar's Palace, by Ward Landrigan, who then ran Sotheby's New York jewelry department. Elizabeth Taylor has Written a Book about her Jewelry Collection which can be purchased here. The Peregrina Pearl is one of the largest Natural Pearls in existence and like the Baroda Pearls of immense historic importance. Believed to have been found around Panama, in the Caribbean by a slave diving for pearls who was granted his freedom when his owner saw the value of this pearl. La Peregrina Pearl then became part of the Spanish Treasury. Thousands of years before the begining of Cultured Pearls, ere Kokichi Mimikmoto was even a glint in his noodle shop owner's father's eyes, La Peregrina was worn by Mary Queen of Tudor on her Wedding day in 1554. It was a gift from her husband King Phillip II of Spain. Some people say that the La Peregrina was acquired by Russian royalty in 1826. "La Peregrina" is often confused with "La Pelegrina Pearl" - Notice the substitution of the letter "L" in the middle of the word. Pelegrina Pearl, an ovoid natural pearl of 28 carats that was given by Philip IV, to his daughter, Maria Theresa upon her marriage to Louis XIV of France. Pelegrina Pearl was later brought to Moscow by Princess Youssoupoff. At the time of the sale of La Peregrina in New York in 1969, its identification was challenged by Spain's ex-Queen, Victoria Eugenia. Internally, imperial Russia commissioned master-craftsman from all over Europe around this time period. The European and Russian ateliers priceless treasures and Kremlin Diamonds are conserved within the Great Kremlin Palace. The Peregrina Pearl can be seen in the paintings by the famous artist Velasquez of Phillip IV's wives. "The attire of ladies of quality was very rich and magnificent, especially in gems and pearls." Dunlop, J., Memoirs of Spain during the reigns of Philip IV. and Charles II from 1621 to 1700. La Peregrina then travelled on to become the possession of Joseph Bonaparte, who sold it to the Marquis of Abercorn of England. 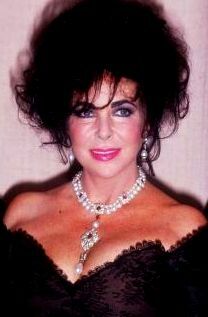 Elizabeth Taylor's Jewellery collection fetched a landslide breaking $115 million =£75 million victory at auction in New York on the 13th December 2011. Ravishing La Peregrina Natural Pearl with the pear shaped body was the centre of gravity. 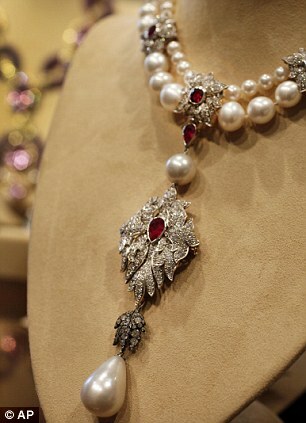 The necklace on which La Peregrina Pearl gravitates fetched a world record price of $11,842,500 = £7.6 million. Newman, H., An Illustrated Dictionary of Jewelry, Thames & Hudson, London, 1981.